Interior Car sticker, designed for a car rear window. Will work with or without tinted windows. This sticker is to be used on the inside of the car window, do not apply to the outside of the vehicle. 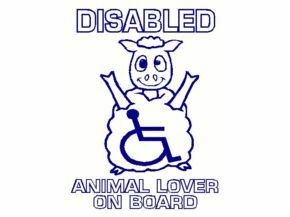 Sticker Reads "Disabled Animal Lover On Board"